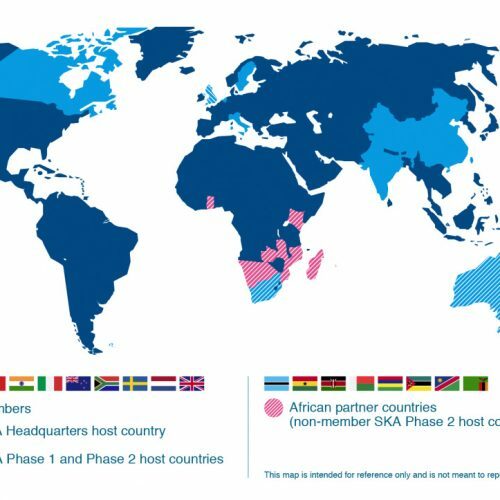 The SKA components will be split between the African and Australian site, with Australia hosting the low frequency elements (SKA-low), and southern Africa hosting the mid to high frequency elements. 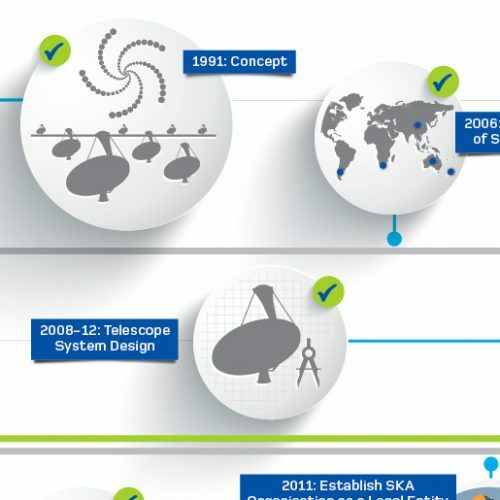 The SKA’s Critical Design Review is the final engineering step to seal the design of the telescope after four years of work by teams from around the world. The SKA was divided into nine major sub-elements, each managed by an international consortium representing some of the best companies and institutes in the world. Each consortium has to pass a critical design review, some including some sub-reviews, for its design to be approved. The low frequency SKA, with its extremely wide field of view and unprecedented sky-scanning speed, will provide an overall map of the sky which will guide more detailed investigations by the mid and high frequency components. 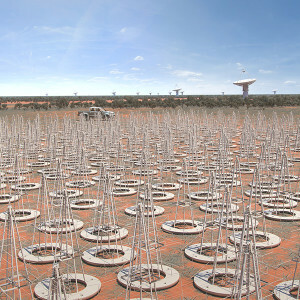 Computer generated image of what the SKA-low antennas will look like in Western Australia. Credit: SKA Project Office. The Low Frequency Aperture Array (LFAA) will be located in Australia, primarily in Western Australia. Observing frequencies in the 50MHz to 350MHz region, SKA-low will probe 13 billion years back in time to the period when the first stars and galaxies began to form. Phase 1 of SKA-low will deploy roughly 250,000 identical antennas and amplifiers. The array will be supported by local processing technology to combine the individual signals and transport them to the final supercomputing facility that will conduct final data processing and storage. The antennas have been designed to minimise cost and maximise ease of deployment and reliability in the remote environment. The core of the array will be tightly packed, with 75% of antennas located within a 2km radius (at approximately 1.5m separation). The remaining antennas will form spiral arms spanning about 50km to enhance final image detail. The Mid Frequency Aperture Array (MFAA) will observe radio frequencies above 400MHz and will measure the effects of dark energy, explore galaxy evolution and conduct high-speed surveys for fast bursts of radio waves (radio transients). 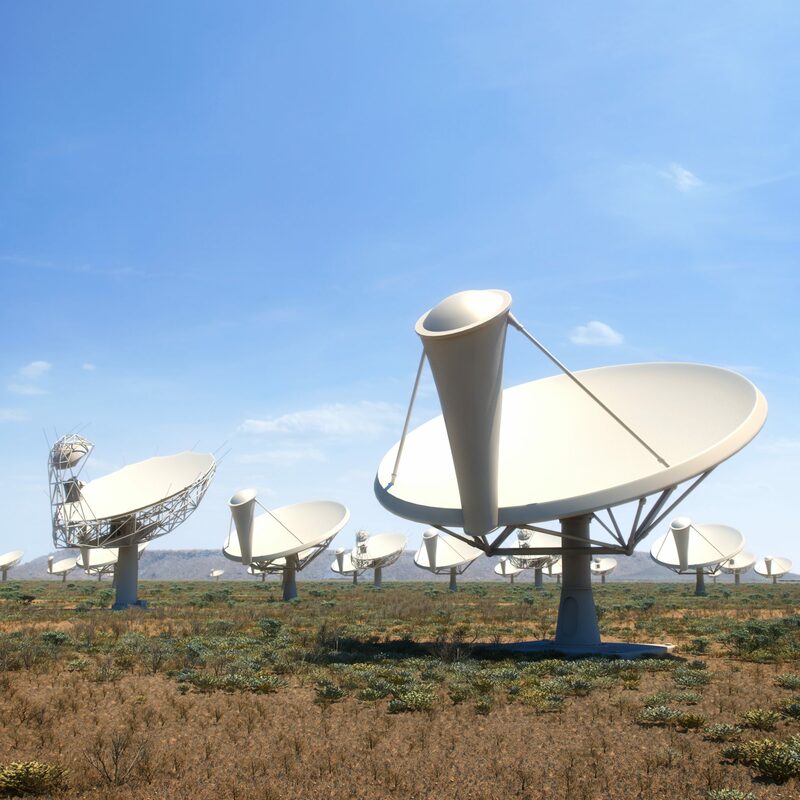 The MFAA will be deployed in Phase 2 of SKA construction in South Africa. Like the LFAA, the MFAA will consist of a set of antennas, amplifiers and local processing facilities. The MFAA Consortium is currently evaluating emerging design concepts and feasibility testing available technologies at Electronic Multi Beam Radio Astronomy Concept (EMBRACE) stations in the Netherlands and France. Computer generated image of what the SKA dish antennas will look like in South Africa. Credit: SKA Project Office. Mid to high frequency SKA dishes will observe radio frequencies up to 20GHz, searching for transient events (including extraterrestrial life) and cosmic magnetism. 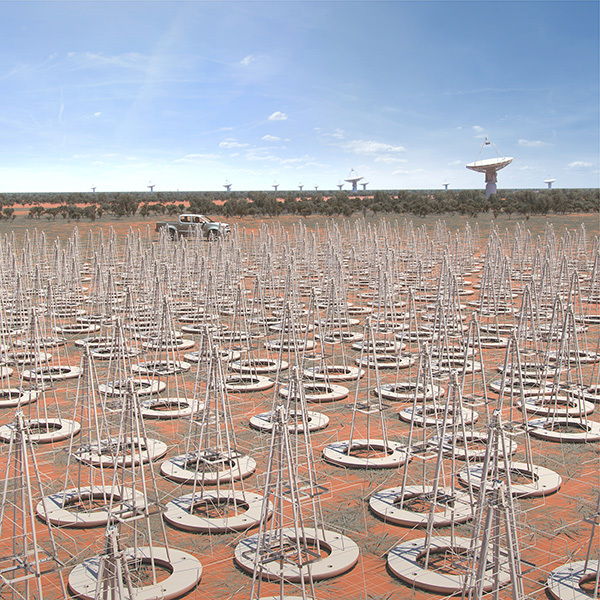 The dish component of the SKA will be constructed and deployed in both phases of the project and consists of thousands of steerable 15m diameter radio dish antennas, some with CSIRO’s Phased Array Feed technology. Every dish will be made from carbon fibre composite, manufactured to unprecedented accuracy, and robust enough to handle the harsh environment. Three prototype dishes have been developed and the optimal design will be selected for detailed engineering and testing phases. The exceptional sensitivity of these dishes also requires the use of low-noise amplifiers and cryogenic cooling. Transporting, processing and storing the extraordinary amounts of data generated by the SKA will require incredible computer power – at peak operation it could generate more data than the entire internet in one day. Once commissioned, the SKA will be supported by a supercomputer capable of more than 100 petaflops (one hundred thousand, million, million floating point operations per second), three times more powerful than the world’s top supercomputer in 2013. 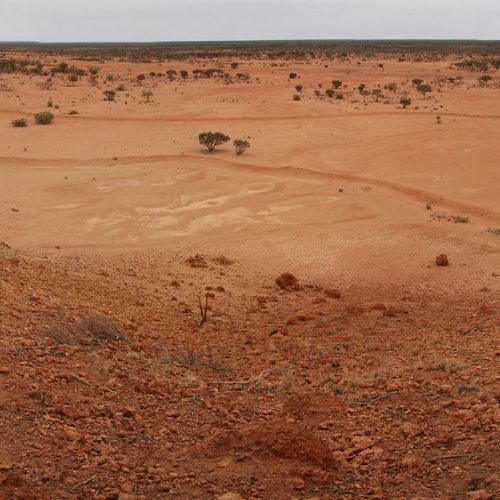 ICRAR is heavily involved in the design of the SKA’s data processing requirements and plays important roles in the Central Signal Processing (CSP) and Science Data Processing (SDP) work packages in the SKA Pre-Construction program. The CSP will combine the signals from multiple antennas into data that can be fed to the SDP, which will produce science-ready images and information for researchers to use in their work. The Australian SKA supercomputing facility is located at the Pawsey Supercomputer Centre in Perth. The Pawsey Centre’s top supercomputer, Magnus, is the most powerful in the Southern Hemisphere and is already processing the wealth of data from ASKAP (Australian Square Kilometre Array Pathfinder) during its commissioning and the Murchison Widefield Array (MWA) since it began operations in 2013.